Melting aluminum was actually one of the biggest challenges I have ever undertaken. With only the internet to guide me, I alone took it on with failure not an option. Although aluminum being on the lower end of the melting scale at only 1220ºF, it still needs about to be 1500-1600ºF to stay liquid enough for casting. Sure I could have bought a book. But honestly (and it's happened before), books have a tendency to sometimes complicate things. 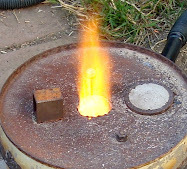 So after review of other people's backyard metal-casting websites, making a homemade furnace seemed simple enough to do on my own. Note: The following information are my experiences building and using a home-made furnace, yours may vary. Additionally, if you experience personal property loss, become injured, or are killed playing with fire --it's not my fault! I won't bore you with my research, but I eventually found that a flower pot furnace was the down-right simplest, dirtiest way to melt aluminum. No special tools are required --just some commonsense, and a willingness to succeed. Solvent can from local auto-body shop. Top 2" marked with pen. 2" hole cut into center, and a square tube piece bolted on for lifting. scrap metal for your lid lifting handle, etc. You've got to have a flower pot big enough to accommodate the can & a stand, the lower vent tube, and lots of briquettes. Steel tube used is actually a 1937 Ford steering column cover. Luckily I had the perfect flower pot in the backyard, thick-walled and with no cracks. I also had lots of scrap metal pieces laying around, leftovers from car building. The tube is a car steering column cover, closed at one end with many holes drilled into it. The 5-gallon can was also free, it's from an auto body shop, and really was the perfect size. All I had to pay for was the cement. Making the hole in terracotta was actually easier then I though. A drill and round file were used to shape it out. OK, the can was a little too deep. So I stuck a brick underneath, but it still wasn't tall enough. So then I put a flower pot base under that --now it was fine. Here you can see I cut a hole in the side of the can for the tube exit. Here, all the pieces mocked up, with just enough room to get cement down between the pot and the can. The lid was easiest. First, I inserted the 2" tube through the center hole I cut earlier and taped over the old can's pour hole. Then filled with cement; flat and to the top, on a level surface. Next: the lower body. I filled the bottom 2" with wet cement to the level of the brick to which the pot will stand on. I then replaced the flower pot and tube back in the can and proceeded to fill the gap between them with more wet cement. A long rod was used to push the clumpy cement into all the spaces, trying not to leave any pockets of empty air. My flower pot sat almost an inch below the top of the can. Rather then trim the can I simply made a wall of additional cement and leveled it perfectly with the top of the can. For the handle I used two very long, junk bolts welded together as a lid lifting hook. It also keeps my hands far enough away from the super-heated flames that shoot out of the upper vent hole. I usually fill the steel food can with as much scrap aluminum before placing into the furnace. Then stick scrap aluminum rods through the hole in the top of the furnace to fill the can 3/4 full before the pour. 1. You'll will create a lot of crappy, impure aluminum that won't pour. 2. They are worth more whole then melted. 3. You'll need to melt like 100 of them, and you're wasting your time. Crudely made scrap steel can stand with holes for air flow. For a better sources for scrap aluminum: First, look around, it's all over the place! If you work on cars, broken engine parts are a great. A hacksaw may be needed to make pieces small enough to fit in a can. But the best source is a metal retailer warehouse like Industrial Metal Supply in the San Fernando Valley. They sell scrap remnants for about a dollar a pound. Short, thin rods melt quickly. A damaged alloy wheel is useless --except to you! Hammer it into pieces. It's made of A356 aluminum, perfect for casting; more silica, better flow. My specialty tools; long handled spoon, crucible holder, regular pliers, and furnace lid-lifter. Note: Before firing, melting, or pouring your first metal, it is helpful to rehearse the motions. By knowing in advance that you will have trouble lifting the crucible out of the furnace for instance, you can avoid possibly dangerous mistakes. Only use name-brand charcoal. Supermarket brand & discount briquettes may be less expensive. But they use sand as a filler to bulk up the weight. Yes, sand! Don't waste your time and money like I did. Kingsford Brand (available everywhere in the US) only left ash behind after firing, and was the only charcoal I have used with success. Before firing up; tape the COOL button down on the hairdryer. Then I use duct tape to seal it to the inlet tube (vacuum hose optional). Just a little newspaper is needed to start the Kingsford Matchlight. You don't see the can in there now, but I usually start it with the can full of scrap aluminum and the flower pot half-full of coals. I'll throw a match in and turn the hairdryer on HIGH, and keep it on until I'm ready to pour. While the metal in the can inside liquefies, I'll keep more additional scrap metal on top to preheat. Below, you can see me adding more briquettes to the fire part way through. Each batch of coals tends to last about 5 minutes before the intensity wears down. Total furnace time, from cold to pourable liquid: about 15 minutes. Now that the initial can of metal is melted I add more through the hole in the top. The rods slide into the can by themselves as they melt. To my experience, I am able to have all the metal need for a car club plaque, about 3/4 full of liquid, by the end of the second burn of charcoals. But it's already started to cool off! So I don't end it there! I'll add a third helping of briquettes and it gets the steel can to a light orange glow. I really want to make sure that I have enough heat so the aluminum will flow into all the crevices of the sand mold. The final moments, did you watch the video? Here is what happened: first I turned off the hairdryer. And now with my gloves & face-shield on, I opened the furnace and quickly used my long handled spoon to scoop off the dross (metal waste) that had accumulated at the top of the can into a metal container. Next I used my crucible holder to gently lift the can out of the furnace. The liquid aluminum is approximately 1500ºF and is as liquidy as water. At this temp, if it were to spill some on anything organic (plants, wood, human flesh) it would char instantly. And with one constant & even motion I poured the liquid metal into my previously prepared sand mold only three feet away.